Ever thought of camping in a breathtaking place? There are lots of places you can visit, but some do not create lasting memories. You need to check on the list I have compiled below. On it, you'll learn about features of some of the most exciting places to camp in the U.S.A Enjoy! You don't have to miss this American treasure as it has inspiring nature. My favorite site at this place is the North Rim Campground as it is breathtaking in many ways. You may use a features tent or an RV and get an incredible experience. More info here..
​It is one of the most spectacular places to camp in the U.S. with its cliffs offering an excellent scenery. Moreover, you will come across archeological sites that will make you learn much about the history of Hawaii. However, remember that you have a limit of five days. Get more information here. The place is home to more than 2000 sandstone arches and wildlife such as technicolor lizards and falcons that may appeal to your eyes. The Devil's Garden is open year round and has facilities that include picnic tables, grills, and potable water. Get more information here. ​5. Sahale Glacier Camp, Washington! ​No one gets disappointed after walking among flowers, boulders, and peaks of ice that offer one of the most amazing alpine landscapes in the world. You can enjoy mountain hiking or swim in the Doubtful Lake. However, you need to choose camping when the weather is nice. Get more information here. You will enjoy ice climbing and swimming in caves. There are sand-filled sleeping bags for you to enjoy your slumber and solitude. However, you need to forget your bike or pet as the authorities do not permit them. Get more information here. 7. Captivate yourself in Catalina Island. It is among the best places to camp in the U.S. for its outdoor activities. You will find this place gorgeous to go kayaking. You need to camp near the crystal blue waters to experience a fantastic view of the site. Get more information here. 8. Explore the Adirondacks; you'll love it! ​The place has clean mountain air and endless adventures in the mountains and water. You will have a variety of camping methods such as island camping for your experience. Get more information here. The place on the Canada-U.S border offers many lakes and a big array of plants and animals. You can enjoy a crackling campfire and sleep under the stars at night. Besides, there are more than a thousand sites to love. Don't forget to carry bear-proof cans. Get more information here. There is gorgeous scenery on the outside of your tent where you'll experience waking up to a beautiful view of the cliffs glowing orange and red in the morning sun. Remember that you won't escape a spectacular view in any direction you look. Get more information here.. The amazing lake has several campsites and shallow waters that you will remember for a long time. There is a likelihood of seeing the aurora borealis from the region. You can also spend your day hiking, canoeing or sitting around a fire. At night, you will have a beautiful view of the stars. Get more information here. 13. For beginners, Round Bald is perfect! The site offers an excellent place to introduce backpacking to kids. It can also serve you if you can’t have a longer trip during your weekend. A short hike will give you a grassy view of the Appalachian Mountains which you will always remember. Get more information here. It has equipped tent pads and picnic tables. There are several wildlife species including grizzly bears, so you have to follow storage rules. Remember not to light a campfire around the campground. Get more information here. For the perfect night under the stars and a morning watching the rolling hills, this place will suit your eyes to the fullest. Besides, you can break from driving and explore the sand dunes. I recommend you carry a skateboard to slide on the sand dunes. Get more information here. It is one of the best camps offering car camping. You can also enjoy a bit of photography, hiking, and yoga. The place is suitable for a newbie and is open year round for your enjoyment at any time. Get more information here. Sawtooth National Forest offers unforgettable back country skiing and mountain biking experiences. During winter, get a guide for a winter route. The place makes cooking an easy task as there are water and other tools in plenty. Get more information here. The site has a great view of Coconino National Forest. The vistas of the forest make the place a favorite for hiking and exploration during the daytime. You can come along with your dog as there is dog-friendly wildlife. Get more information here. The site offers peaceful mountain scenes and the freedom to choose from an RV, a cabin or a tent. Most importantly, you can enjoy swimming and watching wildlife. Don’t forget to carry a camera. Get more information here. You will experience white stripped and orange ‘Spanish Skirts' rise behind the campsites. You'll have your freedom while camping. Hiking and mountain biking are the favorite activities for most campers. Get more information here. The place offers a memorable experience for a family camping. There are water activities such as surfing, canoeing, and swimming. Don't forget to explore the ‘wild horses' and collect some shells. Get more information here. It is the perfect place for hiking and climbing. Be sure to come with plenty of water as the place has no showers or running water. One of the major highlights of the site is a geological formation that runs 30 feet across. Get more information here. 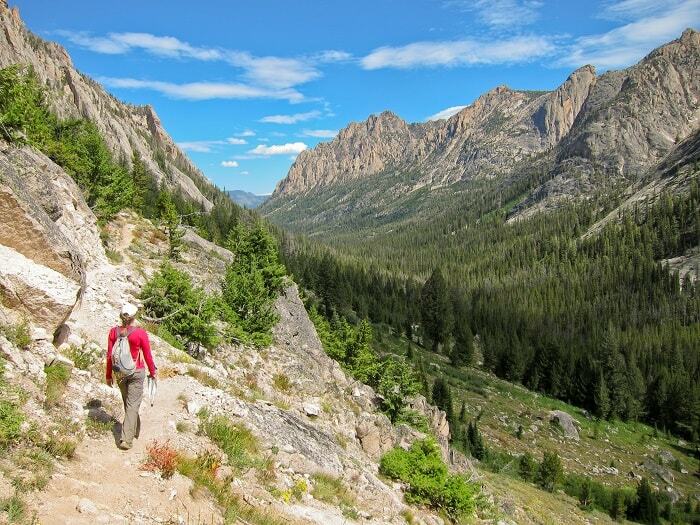 You will get spectacular views of the Gros Ventre Range and the Tetons. There is also some fishing and hiking in the area. Don't forget to watch wildlife as there are plenty of bears, moose, and elk. Get more information here. The place gives you plenty of choices to have your favorite campsite. Moose and elk are frequent in the area so have your camera ready for a snap. If you visit the place during the new moon, keep an eye for the Milky Way. Get more information here. Did you enjoy reading the list above? Did you learn of new places that you've never heard of before? I bet this list will help you get the best experience when you camp. We recommend you use it to organize yourself on where to go at any given time of the year. You may give your thoughts in the comments and share the article if you found it helpful or interesting. 7.Captivate yourself in Catalina Island. 8. Explore the Adirondacks; you’ll love it!